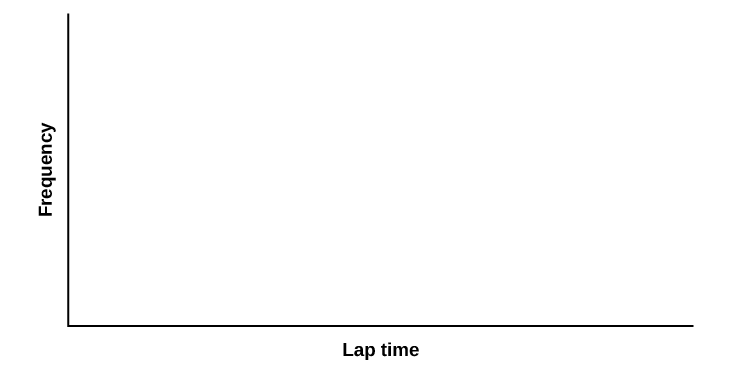 The student will compare and contrast empirical data and a theoretical distribution to determine if Terry Vogel’s lap times fit a continuous distribution. Use the data from Appendix C. Use a stratified sampling method by lap (races 1 to 20) and a random number generator to pick six lap times from each stratum. Record the lap times below for laps two to seven. Using your sample mean, sample standard deviation, and histogram to help, what is the approximate theoretical distribution of the data? Use the data you collected to complete the following statements. Using the theoretical distribution, complete the following statements. You should use a normal approximation based on your sample data. Normal Distribution (Lap Times) by OpenStaxCollege is licensed under a Creative Commons Attribution 4.0 International License, except where otherwise noted.